In the tropics, I’ve seen weeping figs as large as our sugar maples. In large pots indoors, I’ve seen — and once had — weeping figs 6 feet high. I planned for one of my new weeping figs to call home a rectangular pot 1 inch deep by 6 by 4 inches long and wide — for its whole life! Another of the weeping figs was destined for a round pot just a bit over 2 inches wide and deep, also for life. To fit these small plants into even smaller pots, each got its roots and tops clipped back, the roots for a good fit into its future pot and the tops to balance root loss and to give the “tree” an attractive form. All this began last summer, and the plants spent a few weeks in light shade to recover from the butchering. 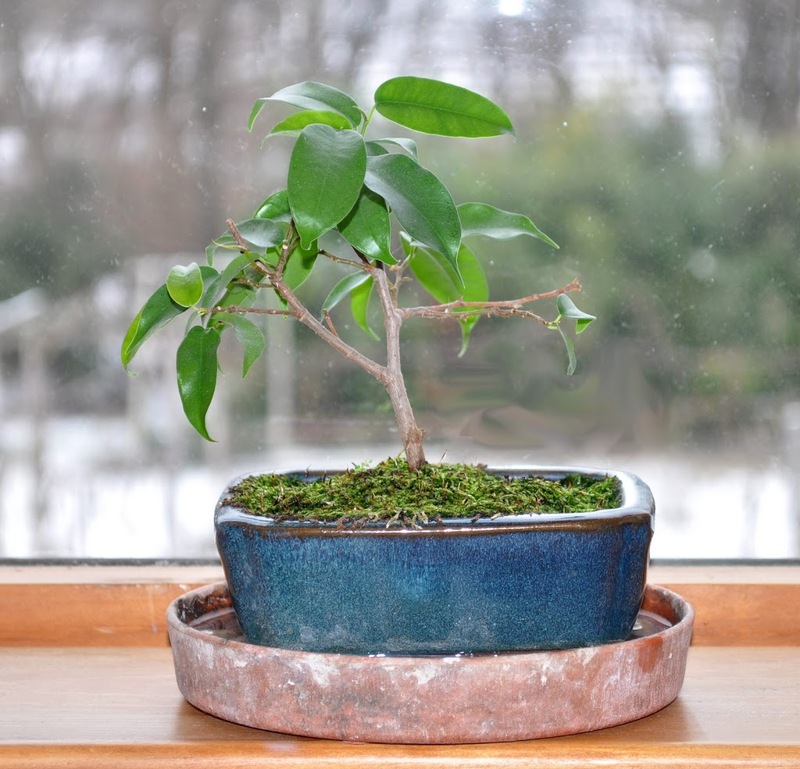 I also wrote that “leaf pruning is not for every bonsai. Do not do it to evergreens . . .” Weeping fig is evergreen. Oh well, I’m going to try it anyway. 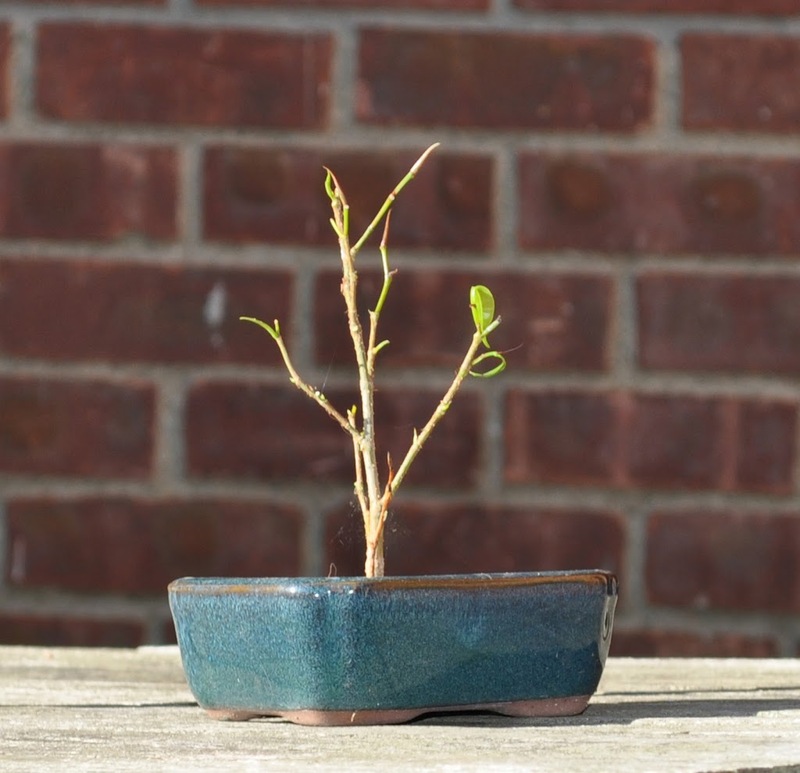 This is the bonsai last summer, after I snipped off all its leaves. As the plants age and their trunks thicken, I’ll help them along on their way to wizened gnarliness, creating dead stubs, gouging out wood where branches are removed, and, if necessary, using temporary wires to direct branches. Plants need to be healthy to tolerate such treatments. In a few weeks, and every late winter or spring thereafter, I’ll tip the plants out of their pots, cut back some roots, and then snuggle the roots back into the pot refreshed with new potting soil. Branches also will get pruned at least yearly for health and beauty. It doesn’t seem premature to state that I’ve failed again: Three jasmine plants are, once again, all leaf and no flowers. Jasmine (Jasminium polyanthum) is a plant that is easy to grow and easy to propagate; hence all the greenery and the number of plants I’ve had over the years. The main reason to grow jasmine, though, is for the sweet perfume with which it fills the air when in bloom. At least I think it’s a sweet perfume because I can hardly remember the aroma. I got the original plant 11 years ago and remember how proud I was getting it to rebloom for the first couple of winters. So what makes your typical tropical or subtropical winter blooming plants — Christmas cactii, poinsettias, amaryllises, and the like — bloom when they do, or at all? A period of cool temperatures, short days (long nights, actually), or dryish conditions. Any or all of these changes for a period of time in autumn triggers flower buds for winter. My three jasmine plants have received the requisite treatments yet, as I stare at the plants, I see no hint of a flower. 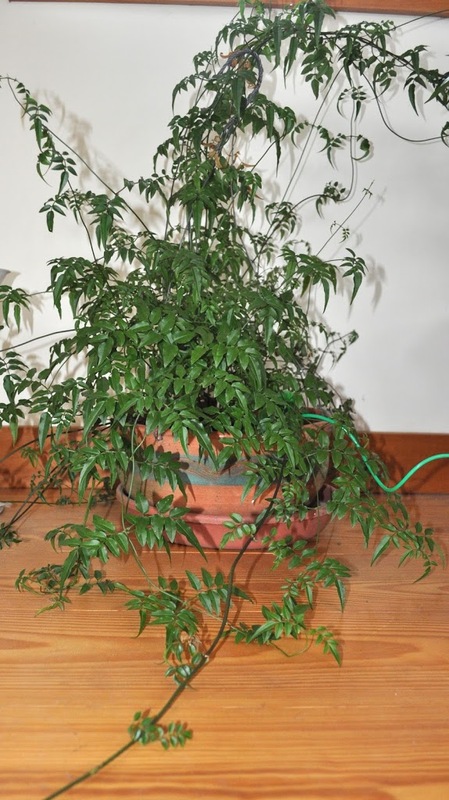 Just lanky stems grabbing at other plants or sprawling on the floor. A friend suggested that my jasmines have grown old. They did all originate as cuttings from my original plant of 11 years ago. It’s not a good explanation but the only one left. I’m buying a new plant. No, I’ve decided not to buy a new jasmine plant. I’ll give my plants one more chance (as I have every year for the past 9 years). White Flower Farm nursery, which has sold jasmines for years, offers some more exacting instructions on growing the plants: “Prune as necessary to control size or to maintain shape, but stop pruning by August 1, because the plant sets flower buds in late summer. To encourage the formation of flower buds for next winter, be sure your plant experiences the cooler temperatures and shorter days of early autumn. The plant needs 4-5 weeks of nighttime temperatures between 40° and 50°F, plenty of sunlight, and the complete absence of artificial light after sundown. Bring the plant indoors before frost. Then give it cool temperatures [below 65°] and indirect [but bright] light until it blooms again in late winter.” I will follow these instructions to the letter. Wish me luck. Last post I mentioned battling scale insects on house plants with sprays of horticultural oil in autumn. A reader wrote to offer another remedy: soap sprays. I’ve also used soap at various times, and it is effective, especially specially formulated “insecticidal soaps.” You do have to be a little careful because some soaps at some concentrations can damage some plants. (That’s a lot of “somes.”) The reader mentioned the especially environmentally friendly tack of saving shower water in a bucket, which, the reader wrote, results in a perfect soap concentration for insect control. Whatever works.